The Scottish government has been urged to launch an inquiry after the death of a woman was linked to controversial mesh implants. 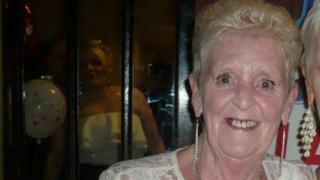 Eileen Baxter, 75, from Loanhead, died in hospital in Edinburgh last month. Labour MSP Neil Findlay said that he believed it was the first time mesh had been specifically cited as an underlying cause of death in Scotland. Nicola Sturgeon said the government would consider a review if it received information about Mrs Baxter's case. The use of mesh implants in NHS Scotland was suspended four years ago in all but exceptional circumstances. Raising the circumstances of Mrs Baxter's death at First Minister's Questions, Mr Findlay asked: "With this new information will the first minister now instruct an inquiry into Mrs Baxter's death? "Will she instruct NHS boards not to buy one more box of mesh implants? Will she instruct the NHS to clear their shelves of all mesh? "And will she make sure that not another implant is carried out in Scotland using this grotesque and deadly product?" In response, Ms Sturgeon said the Scottish government would "give careful consideration" to whether a review was required. The first minister said she planned to discuss mesh implants with Health Secretary Jeane Freeman later. Ms Sturgeon added: "The use, other than in exceptional circumstances, remains under suspension in NHS Scotland. "We've seen the number of operations fall dramatically. In the six months to March this year there were 33 operations carried out. That compares to over 1,100 in a similar period in 2013/14. "We will continue to have that suspension in place until the chief medical officer is satisfied. The chief medical officer also announced some further actions followed the petitions committee report. "Medical devices across the UK are regulated by the medicines and health care products regulatory agency and that is a reserved matter, but we will continue to work within the health service to ensure that we are taking appropriate action. " Multiple organ failure was cited as the primary cause of death on Mrs Baxter's death certificate, but "sacrocolpopexy mesh repair" is named as an underlying factor. Earlier Mrs Baxter's son, Mark, told the BBC's Victoria Derbyshire programme that he was "very angry" about his mother's death. He said her health had slowly declined after she underwent the procedure. Mr Baxter, from Peebles, added: "Mum had said she would love to do something about this if the mesh implant caused all the problems, but mum was so poor and we were just more interested in mum getting better. Sadly it never turned out like that." He said he was angry at the pain his mother had suffered and that he was "getting no answers". "I'd love to ask why, why this happened?" he said. "Could they have put a stop to this?" Last month Holyrood's Public Petitions Committee called for a complete ban on the use of mesh implants, citing "serious concerns" over an independent review into their use. It concluded the procedure must not be offered "routinely" to women with pelvic organ prolapse. However the final report of the independent review was branded a "whitewash" by women who have suffered painful and debilitating complications from mesh, including campaigners Elaine Holmes and Olive McIlroy, who brought the issue to prominence when they lodged a petition with the Parliament on behalf of the Scottish Mesh Survivors campaign. April 2014 - Campaigners lodge a petition at the Scottish Parliament, calling for a suspension of mesh implant surgery. June 2014 - Women, some of them in wheelchairs, give evidence to Holyrood's petitions committee about the debilitating consequences of their surgery. Health secretary, Alex Neill asks Scotland's health boards to suspend the use of mesh while an independent review is carried out. October 2015 - New health secretary, Shona Robison, apologises to women affected and says the suspension will remain in place. December 2016 - Figures obtained by BBC Scotland reveal that 404 women have received mesh and tape implants since the health secretary called for the suspension in June 2014. March 2017 - Patient representatives Olive McIlroy and Elaine Holmes resign from the independent review group, claiming its final report has been watered down. The review says the procedure should not be used routinely for pelvic organ prolapse cases, and for incontinence, women should be given full information about the risks before making their decision. August 2018 - MSPs call for a complete ban on the use of mesh implants in Scotland.